Last fall, Danielle Martin, a forest pathologist for the U.S. Forest Service in Morgantown, and her colleagues noticed something different about the oak trees in Seneca State Forest. The trees secreted an amber-colored sap and bore cankers — which look like canker sores — underneath their bark. 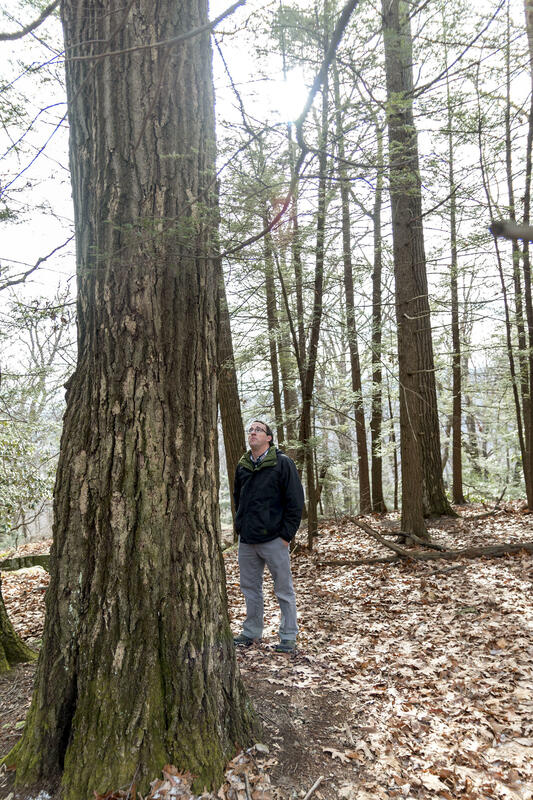 “We saw a vertical crack with perhaps some weeping, a bleeding appearance — like an amber bleeding — and that’s when we’d remove the bark and look for cankers,” Martin said. Martin worked with Matt Kasson, an assistant professor of forest pathology at West Virginia University, and his graduate students to diagnose those trees with diplodia corticola. Diplodia corticola is an aggressive disease that limits the ability of oak trees to access essential nutrients and water, ultimately killing them. It was first reported in Europe, and has since emerged in Florida, California, Massachusetts and Maine. This is the first time that it’s been found in oak trees in West Virginia. While the timber industry is aware of the new disease, they’re not concerned just yet. Kasson says West Virginia residents should be concerned because as oak trees weaken, they are more likely to fall and hurt people — especially in recreational areas. Tree diseases aren’t new to West Virginia. In the early 1900s, chestnut blight wiped out billions of chestnut trees in the United States, including those in Appalachia. Hemlocks and ash trees are also battling illnesses. In fact, Martin says these tree diseases, coupled with mass logging, may have helped diplodia get its start in southern West Virginia. Fortunately, Martin isn’t concerned about diplodia wiping out oak trees on a large scale in the area. She does think the disease will weaken the trees as a whole, making them more vulnerable to stressors like drought or insect infestations or flooding that could serve as the final blow to the tree’s health. Kasson agreed. “I think us detecting this diplodia canker on oak is only the beginning. I think with all this flooding that we’ve had this past summer, we will see a sharp rise in the amount of predisposition and subsequently in the rise of fungal infections in oaks and in other tree species in that part of the state,” he said. The two will look into what is causing the outbreak in West Virginia and what could be used to cure it — in hopes that they can find an end to what seems to be the beginning of a new tree disease outbreak.